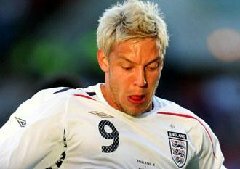 Newcastle have reportedly won the race to sign firebrand striker, Alan Smith, from Manchester United for Â£3.5m – fighting off apparent interest from Middlesbrough, Villa and free-spending Spurs. Smith aired his disappointment at not being offered a new contract at Old Trafford and Allardyce appears to have acted quickly to add some ‘never say die’ determination to Newcastle’s pampered squad – with serial psycho, Joey Barton, also arriving training sessions could carry a health warning! Smith faced the wrath of his hometown Leeds fans when he moved to bitter enemies United in 2004. Ferguson was obviously attracted by his ‘in yer face’ attitude and even tried to mould him into Roy Keane’s replacement. But, after a horrific injury in front of less than sympathetic Liverpool fans he’s been unable to win his place back in the team. And he’ll be leaving without a Premiership medal ‘proper’ after failing to play the required number of league games this season. With Michael Owen, Obafemi Martins and Mark Viduka already on the books, as well as speculation involving Seville’s Fredi Kanoute, is he really going to play more games for Newcastle? Or, does his arrival signal defeat in Newcastle’s attempt to keep Owen in Toon? Didn’t he get a Premiership medal by special dispensation? His second touch is a sliding tackle. Smith, Owen and Viduka? toon might actually score some goals next season.